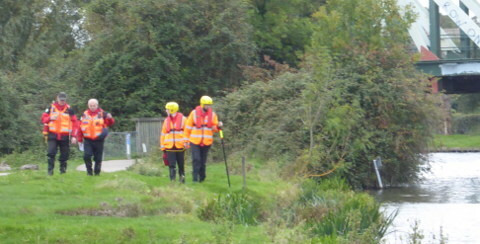 2 October 2017 Cambridgeshire Search and Rescue volunteers at work on Ditton Meadows after a request for help from Cambs police. On Monday 2 October 2017 the four volunteers seen in this photograph were conducting a search for a missing person on Ditton Meadows with UK charity Cambridge Search and Rescue. Here they are seen next to the railway bridge which crosses the river Cam. They were called out at the request of Cambridgeshire police. A larger number of volunteers were seen in the area the next day. This UK registered charity operates without government funding and all staff are unpaid volunteers.